It started during our visit to the Grand Canyon this summer. All the gift shops had postcards of these fabulous vintage posters from the 1930s. I loved them instantly and wanted to share them. So I bought seven and sat on the edge of the Canyon and wrote quick little notes about how stunningly beautiful and expansive and life-affirming it all was and sent them off to my friends and family. And then for the next few days, I thought about each of them opening the mailbox and finding a little note and smiling because there was something pretty and nice tucked in among the bills and new car insurance offers. It's a little Do Unto Others, I guess, because I love getting snail mail. Receiving an unexpected card can brighten my whole day. And so can writing one. I write different things on a card than I would in an email. I don't plan it that way, but I find myself writing about the slope of the snow on our back deck, the song I heard on the radio that reminded me of them, the feel of Jammer curled up next to me. My words are softer with a pen in my hand than with my fingers on the keys. 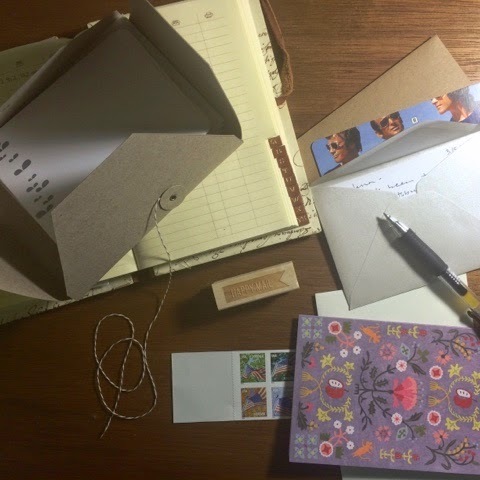 I don't worry about whether life will have changed by the time they receive my card, whether what I wrote on that paper will no longer be true because I think part of the magic of snail mail is that it allows a little time travel. With a letter, I capture a moment in time, the way I was feeling, the things I was seeing, the thoughts that were running through my mind. I seal that moment up and send it away. And a few days later, someone I love experiences that moment again, filtered through their own heart and mind. My letter bent the space-time continuum. I love that about snail mail - the utter snail-ness of it. When I get a card from my friend Beth, I think about the fact that she sent it three days ago and right now she's not even thinking about it. She's eating dinner or grading papers and maybe even forgot she sent me a letter at all, but I'm with her in that moment from 72 hours ago and it's living again in me. I'm not one to spend much time complaining about social media or the speed with which we receive information. I love email and twitter and imdb. But I'm having an affair with snail mail, and it's pure magic. p.s. My new stamp had me pulling out my ink pad, which I haven't used since I made these Thank You cards.